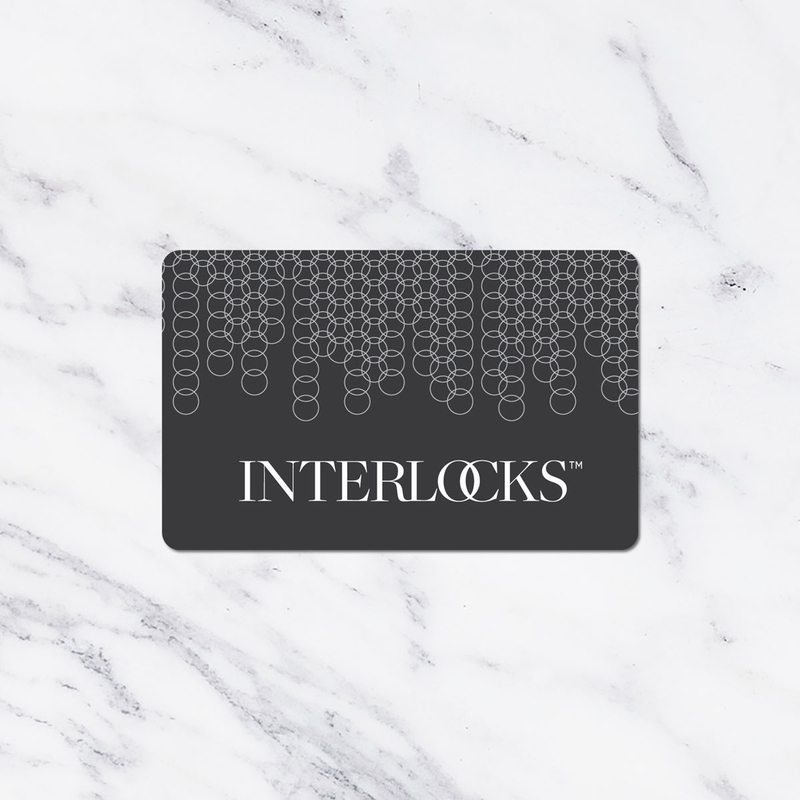 The INTERLOCKS Gift Card is beautifully presented in an elegant card holder. Gift Cards are available in any amount of your choosing, beginning at just $25.00. Your gift recipient may redeem their Gift Card, for its dollar value, toward any of our Salon + Spa services or fine luxury care products in our Beauty Apothecary. You may also add a brief gift note upon checkout. We mail your gift with the utmost care. Note: The gift recipient is not limited in how they choose to redeem their Gift Card. Gift Cards may be redeemed for any of the services or products we offer, equal to the monetary value on the Gift Card. 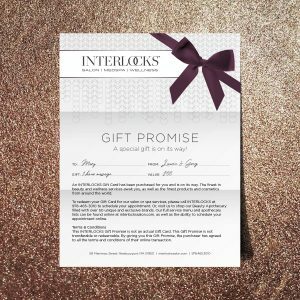 You can place an online order and then print the INTERLOCKS Gift Promise to give the recipient while you await the Gift Card in the mail. Can I redeem an INTERLOCKS Gift Card online? No, gift cards are redeemable at INTERLOCKS only for services and products in our Beauty Apothecary. What form of payment can I use online? Please see the Shipping Your Gifts section below for information regarding the completion of your online order. Can I ship the gift to someone other than myself? Yes. By completing the Ship To section, the Gift Card will be mailed to that name and address. Please be sure to verify the address is correct. Can the To & From sections on the Gift Card holder be left blank? I want to write the names myself. Yes. Please instruct us in the Instructions & Gift Note* (*required) section of your order. Unless you tell us to leave To & From blank, we will write the “Bill To” and “Ship To” names on the Gift Card holder. Can the gift be mailed in an unmarked envelope? Yes. But please keep in mind that the shipping envelope will have no return address should it not reach the intended recipient. INTERLOCKS is not responsible for lost or stolen gift cards. Can a notecard be enclosed with my gift? Yes. When placing your order, you will be given the option of writing a very brief message to the recipient. There is a 140-character limit. Can a service gratuity be added to a Gift Card? No. We are not able to include gratuity as part of a Gift Card. Yes. To place a phone order by credit card, please call 978-465-3010 seven days a week during our normal business hours. Can I place an order online but pick up the gift at INTERLOCKS? Yes. Please specify in the Ordering Instructions that you will pick up your order at INTERLOCKS, 58 Merrimac Street, Newburyport, Massachusetts. For driving directions, please click here. How secure is the INTERLOCKS shopping experience? You can shop at interlockssalon.com with confidence. We have partnered with Authorize.Net, a leading payment gateway since 1996, to accept credit cards safely and securely for INTERLOCKS clients. We do not accept Paypal. Interlockssalon.com is registered with the Authorize.Net Verified Merchant Seal program. We handle your Gift Card order with great care, knowing your gift needs to arrive on time. We make every effort to make this happen, relying on the professional services of the U.S. Postal Service and FedEx Express Service. We complete orders within 24 hours Monday through Friday, mailing by 3 p.m. Eastern Standard Time. Orders placed after 3 p.m. EST are filled the following weekday. Orders placed on Saturdays and Sundays are filled the next Monday or business day, whichever comes first. FedEx does not pick up in our area on weekends. Orders placed on a holiday are filled the next weekday or business day. We mail all Gift Card orders, unless instructed otherwise, via the U.S. Postal Service’s standard, first-class mail. We do not offer tracking for this shipping option. Standard first-class mail generally arrives in 1-3 business days. Please visit the USPS website for information on the postmaster’s delivery services in your area. FREE Shipping per each Gift Card ordered and shipped via U.S. Postal Service, standard first class mail. $18 per each Gift Card ordered and shipped via FedEx 2-Day. Weekday afternoon delivery only. No morning, weekend, or holiday delivery. No Saturday or Sunday pickup. Order by 3 p.m. EST Mon-Fri.
$40 per each Gift Card ordered and shipped via FedEx Priority Overnight, including Saturday delivery. No Saturday or Sunday pickup. No Sunday delivery. Order by 3 p.m. EST Mon-Fri. Please visit the FedEx web site for information regarding overnight delivery in your area. Please refer to the shipping costs listed above. Should you need additional information regarding overnight delivery in your area, please visit the USPS and FedEx web sites before choosing your shipping option. Please note that FedEx does not offer pickup in the greater Newburyport area on Saturdays and Sundays. Our shipping service with USPS first-class mail does not offer a tracking number. If you need to track your package, we recommend choosing FedEx. To track a shipment, visit FedEx. We are happy to assist you. Click here to send us an email and we will reply to your inquiry within 48 hours. To place a phone order by credit card, please call us at 978-465-3010. Our business hours are Monday through Thursday 9 a.m. to 9 p.m., Friday 9 a.m. to 7 p.m., Saturday 8:30 a.m. to 5 p.m., and Sunday 11 a.m. to 5 p.m. Thank you for choosing INTERLOCKS for all your gift-giving needs. Receive a $20 Bonus Card for each $150 spent in gift cards, in-store or online, through Tuesday, November 27, 2018. Bonus card valid for redemption January 1 – April 30, 2019. One-time use per bonus card. Must be presented and surrendered at time of use. Not valid toward gift card purchases or previously purchased services or products. Not valid toward injectable services. Cannot be combined with any offers or promotions. Bonus card has no cash value and cannot be redeemed for cash or merchandise credit. If purchase amount is less than the total amount of the bonus card tendered, you surrender the remaining amount of the bonus card. Will not be replaced if lost, stolen, or damaged. Use of bonus card is acceptance of its terms. Click here to print a PDF version of the Gift Promise, which you can print as you would any document. Please note you will need free Adobe Acrobat Reader software to open and print your Gift Promise (available here).